The proceedings of the summer school held at the Universite Savoie Mont Blanc, France, 'Mathematics in Savoie 2015', whose theme was long time behavior and control of evolution equations. The event was attended by world-leading researchers from the community of control theory, as well as young researchers from around the globe. 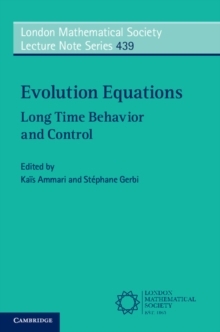 This volume contains surveys of active research topics, along with original research papers containing exciting new results on the behavior of evolution equations. It will therefore benefit both graduate students and researchers. Key topics include the recent view on the controllability of parabolic systems that permits the reader to overview the moment method for parabolic equations, as well as numerical stabilization and control of partial differential equations.